As I watch the news, I am once again reminded of having been in a certain place many years ago. As you have likely seen if you have watched TV news or read a news site, there have been two bombings in Volgograd, Russia in the last few days. This post doesn’t speak to that event, but I felt having traveled there, having friends still living there, I could get thoughts together. 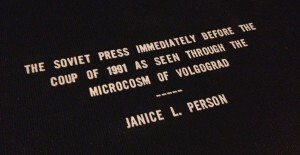 I am sure other Americans have also traveled to Volgograd, but I know very few who have. The train station where the suicide bomber struck this weekend was within view from my hotel. Here’s one of the photos I took of it. And for me, it is important to think about the big picture as well as the detail of the events which are launching Volgograd to new awareness. Disclaimer: the photos I took, well, I realize it seems the processing was less than good and the colors & definition are less than ideal. Am thinking I need to get all the negatives scanned in digitally. In the meantime, I’ll still put some in here. They evoke a lot of memories for me and illustrate a bit of what I saw. Why did I go to Volgograd? 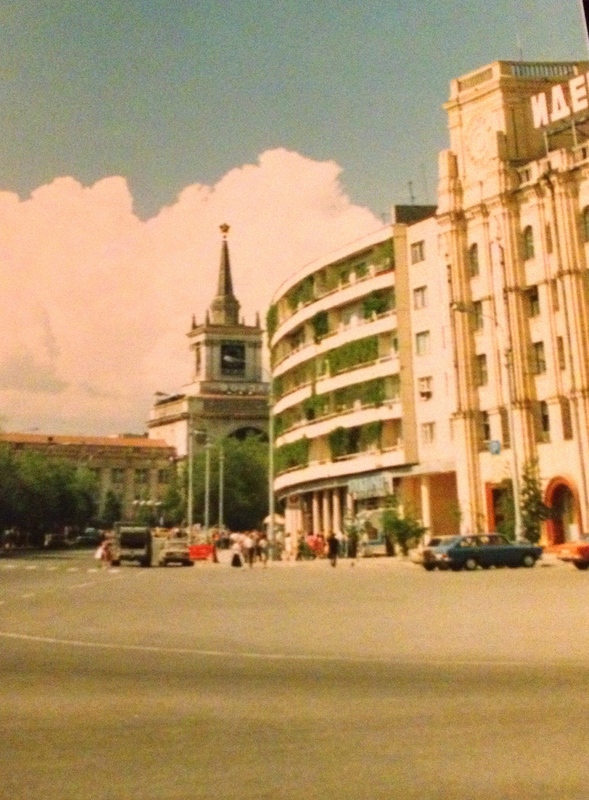 I wrote a post several years ago about what drove me to go to Russia solo several years ago. But it doesn’t get into much detail now that I look at it. Russia was a place that really intrigued me for years and when I was in college, the policies of glasnost were really shaking things up (yes, I know I have a lot of friends who think Gorbachev is a history subject rather than a memory). I prepared a pre-visit survey and conducted in-person interviews with journalists at several newspapers. Having connected with Sergey through a person-to-person exchange program, Volgograd was a city where someone was willing to help me meet the right people and the organization he was part of provided me with a translator while I was there too! All these years later, I need to sit down and read my own thesis! 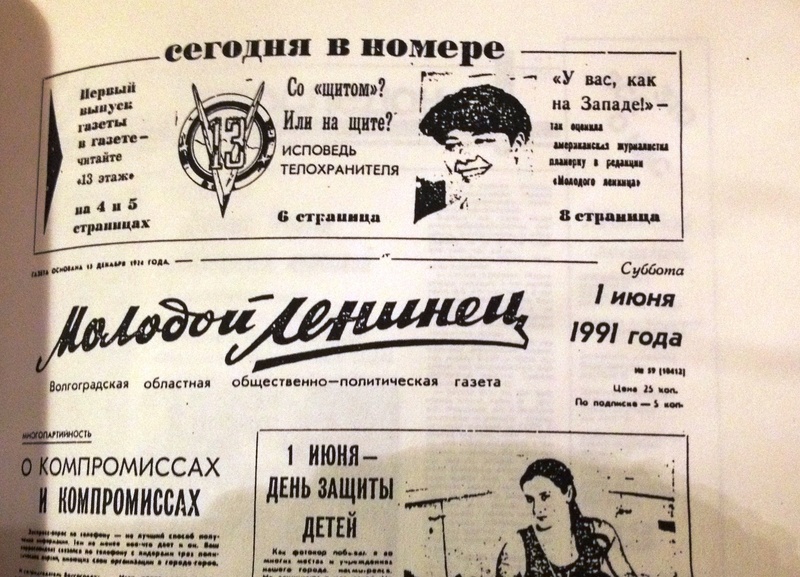 Even though I have a framed newspaper from Volgograd hanging in my office, it has been a long time since I have read the things I wrote, my notes from conversations, etc. 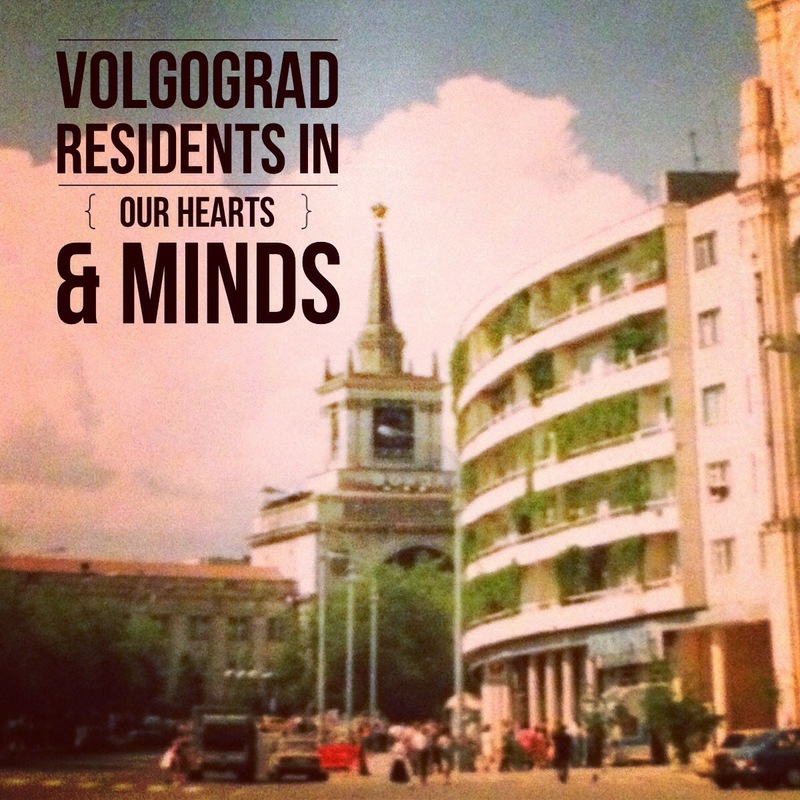 And as I see Volgograd on the news, my mind turns to the many people I had the chance to get to know there. Volgograd is in a southern area of eastern Russia and is about 600 miles southeast of Moscow. 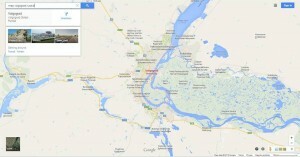 It is the major city on that part of the Volga River. From there the Volga continues southeast to the Caspian Sea. These maps — one showing it in context with the rest of Eastern Europe and one much closer in, give you some ideas. 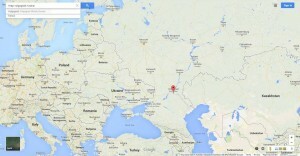 It isn’t far from the Ukraine which is considered the break basket for that part of the world. The ground there is fairly productive and they get a good hot summer if my May visit is any indication. 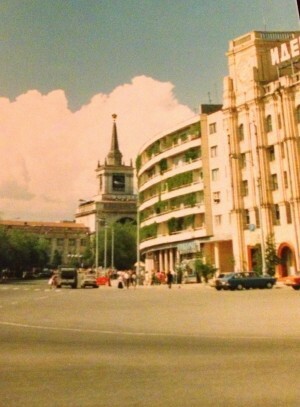 The city of Volgograd is best known to most Americans by the name it had during World War II. 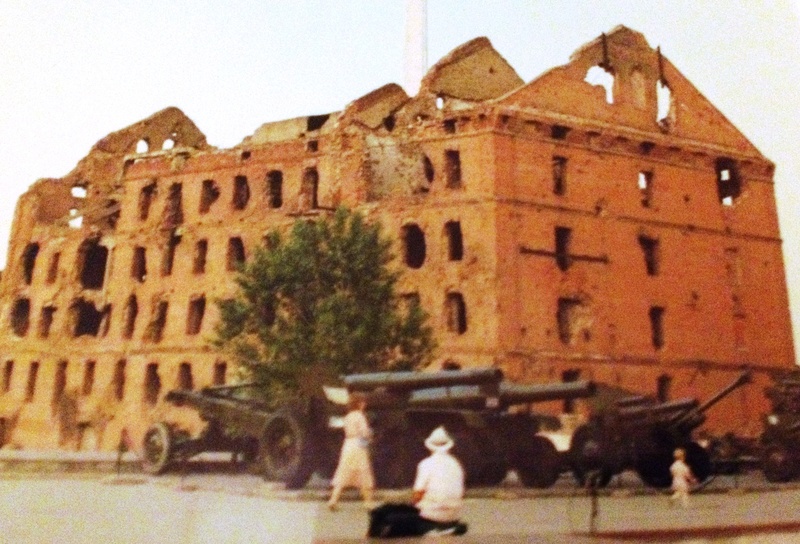 In fact, I usually have to mention Stalingrad in WW II to get Americans to know the city. 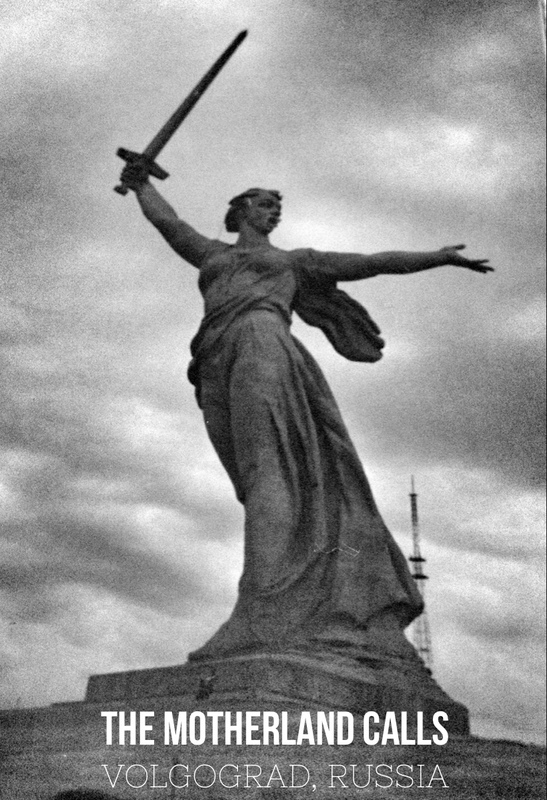 Volgograd is the city that rose from the ashes where Stalingrad was devastated by bombings in World War II. Stalingrad was an incredibly intense battle, with the city holding on far longer than anyone could have expected as the Nazis looked for a path east. In fact, the battle there was so tough that only one building remains, it was a mill, used for making bread, and just its shell remains today. The siege of Stalingrad is said to have resulted in the death of one million soldiers. Hitler was driven to defeat Russia’s Stalin and was obsessed with taking the city that bared his name. The battle of Stalingrad dragged on for five months and was so vivid that several movies have been made about it. The one that stands out for me is “Enemy at the Gates” starring Jude Law as a Russian sniper. The celebration of Russian victory in Stalingrad is celebrated in Volgograd’s The Motherland Calls statue. The day we went to Mamayev Hill was really grey and dark, which may be the best way to think about war but seems less celebratory (and made the degradation of the photos I have seem so much worse so I went for black and white processing). I’ve also seen a lot of photos of the area in bright sun and it is strikingly powerful and beautiful. You can check it out on this site that lets you check out the park in a 360 degree virtual tour of Mamayev Kurgan! While the Motherland Calls statue is definitely the one that grabs your eye and keeps your focus — it is huge at 85 meters tall whereas the Statue of Liberty is just 46 m. There are hundreds of detailed statues telling the story of the war. It is incredibly moving. 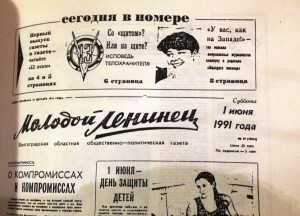 With my mind so on Volgograd, I plan to write a couple more posts on this topic this week. I have been in touch with a friend there and will be sharing some of his thoughts. Do you have questions? Things you’d like to know? 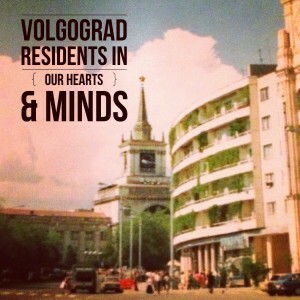 Please join me in keeping the people of Volgograd in my thoughts. I am sure that facing a couple of terrorist strikes in a week tears at many who call this beautiful city home. A followup post provides some of the first-hand observances from my friend Sergey who lives just a few blocks from one of the explosions. « The Year in Review aka What Stood Out in 2013? Thanks for writing this informative article about Russia I didn’t know too much about it before.I enjoyed studying the pictures, too. Happy New Year! I did remember that part of your frau-ness :). It is such a complex part of the world and yet at one time they seemed poised on harnessing their potential in a way that would benefit the people in so many ways. Yet it seems to me (strictly from the outside) that progress has had significant setbacks in recent years. And I have to wonder how much potential there is for an extreme crack down with the Olympics coming. But who knows, the international pressure may keep things lighter. After my freshman year of highschool I spent a month in Europe playing concerts in a orchestra of students from around the US. We performed every two to three days and traveled to seven countries. Our last performance was in St. Paul’s cathedral in London. Quite a trip! Wow. That would have been cool!